Students admitted to universities lacking faculty and curriculum may be violating visa norms, even if they possess a valid F1 visa, and are at risk of being arrested and deported. In a somewhat unusual move, the Indian embassy in Washington, issued a bulletin this week, advising students from India on how to spot notorious fake US colleges and stay away from them. The advisory followed a sting operation in February, in which Immigration and Customs Enforcement (ICE), an arm of the Department of Homeland Security, set up the sham University of Farmington in Farmington Hills, Michigan. ICE arrested more than 600 students who were enrolled at the university; most were deported, while some were released on bail. At least a dozen schools have been shut down or raided by US federal authorities in recent years over allegations of visa fraud. These "diploma mills" admit foreign students but offer little or no instruction. In 2015, federal agents cracked down on Prodee University, located in Los Angeles. It is affiliated with three other schools: Walter Jay MD Institute and American College of Forensic Studies in Los Angeles and Likie Fashion and Technology College in nearby Alhambra. Similarly, Tri-Valley University, housed in a single building in Pleasanton, California, was shut down on January 19, 2011 and labeled a "sham university" by immigration officials. When the school was shut down, over 1,000 foreign students, hundreds of them from India and China, were stripped of their student status and deported. They lost money which they had paid upfront in tuition fees and had their American dreams smashed. The Tri-Valley case sparked protests in India as US authorities clamped ankle monitors on hapless students from India who were cheated out of an education. It is one of the largest US school fraud scams to date. The school's founder and president, Susan Xiao-Ping Su, used over $5.6 million she made in the scam to buy real estate, Mercedes Benz cars and multiple homes. “A number of Indian students enrolled into these Universities, paid the requisite tuition fee and were granted F1 visa as well as Curricular Practical Training permission,” said Shambhu Hakki, a spokesperson for the Indian Embassy in Washington. “The fact that a university is duly accredited by relevant US authorities such as its inclusion in the Student and Exchange Visitor Program (SEVIS), is not an assurance in itself about the bonafides of a university,” cautioned the embassy. Does the university have a campus, or merely keep a website and administrative premises? If it doesn’t have a college campus it is not a bonafide educational institution, and admission into such universities should be avoided at all costs. Does the university have a faculty and regular instructors? Fake universities typically employ only admin staff, and their websites have no information on faculty and college professors. Does the university have a proper curriculum, hold regular classes and actively implement academic or educational activity? Students admitted to universities lacking faculty and curriculum may be violating visa norms, even if they possess a valid F1 visa, noted the Embassy, cautioning students that if they violate visa norms, they are in danger of being arrested and deported. 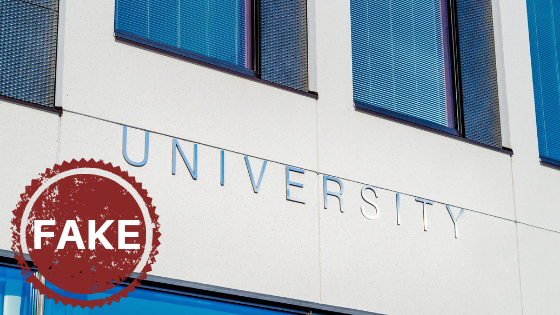 Braingain Magazine published an article titled “Fake U.S Colleges: Watch Out for Six Red Flags Screaming Scam” that you can read to get more comprehensive clues. While anyone can fall prey to a US college scam, foreign students and first-generation college students can be especially vulnerable to degree mills.